Freedom, independence, and fun are 3 words rarely heard in conjunction with life with disability. I have been a quadriplegic for the past 8 years due to the effects of living with ALS and, while people with disabilities are no longer hidden away in shame by their families, nearly every time I am out in public I see someone’s face cloud over in pity. I can almost hear their thoughts of “That poor man”, as if my life were somehow lessened. Less opportunity, less freedom, less fun, they think. I have loved sailing ever since my early teen years in Sheboygan when my father started teaching me to sail, infecting me with his enthusiasm for the sport. There is such beauty and harmony in sailing, working with the other crew, the boat, wind and sea. And there’s the majesty of the sea, beautiful, mysterious, ever changing, always inviting with a hint of adventure. The seas have no boundaries or limitations. Thanks to the people at SEAS and their commitment to making sailing available and accessible to anyone, I, with all my disabilities, can get hoisted into a sailboat and put into a special chair and go for a sail. Not just a passenger, we have developed a series of technical capabilities such that I can steer and trim the sails completely independently. There are no words for what this means to me. Joyful, life-giving, food for the soul, strengthening. These words are certainly present, but they are wholly inadequate. Feeling the wind, hearing the water rush by the hull, and seeing the borderless, boundary-free horizon as my empty wheelchair on the pier fades from relevance is an experience of the transcendent. Although I am deeply grateful to the compassionate and supremely gifted people of SEAS for what they have done for me, what gives me greater joy is seeing how the adaptive program has spread out from its origins in blind sailing to other kinds of disabilities and opportunities, culminating with hosting the 2018 Para World Sailing Championships in September. SEAS put on a highly successful regatta for 100 sailors from around the world, showcasing their professionalism alongside the beauty of Lake Michigan and the hospitality of Sheboygan. I invite you to be a part of growing this highly impactful program. As you are able, please volunteer and give in order that SEAS can continue to grow and provide people with an extremely wide range of disabilities the opportunity to learn to sail. Not just to sail, but an opportunity to crush boundaries, to erase limitations, to feel free and to have fun. Catch all that this happening at SEAS in our monthly newsletter, The Swinging Lantern. Click for December’s issue. My name is Howard Rice and as a new face at SEAS I am pleased to report our team has embraced change and evolution with the aim of reaching more students and the public with a variety of innovative new programs. Our Executive Director Geoff Rudolph set this tone of innovation and new thinking before the grand opening and dedication of the new SEAS facility last spring. His aim was to fully utilize our human and physical resources to this end. I came on board with a mandate to accomplish three distinct tasks in helping to fulfill the new direction. Promoting the good works of SEAS to the public, developing student wooden boat building and hands on skills programs throughout the three-county area and developing an adaptive solo sailing boat. First and fore most in my role I have taken on the task of helping to build positive public awareness of SEAS as a world class Great Lakes center for boating education. As a public speaker and presenter on small craft use I have represented SEAS on several occasions from Milwaukee to Ann Arbor, Michigan. On December 6th I will again be presenting on behalf of SEAS at the Wisconsin Club in Milwaukee. In January I will be a featured presenter at the Chicago Boat Show held in the McCormick Place. I will be making a presentation each day of the show and my boat Southern Cross will be on display. My role at the show will be to help promote SEAS and a sister organization being developed in Chicago known as the Chicago Maritime Arts Center. This important relationship will benefit both organizations over time through many different collaborations centered on teaching young people boat building and sailing. In addition, I will be representing the Voyage of Southern Cross project and all of the SEAS educational and adaptive offerings. The SEAS boat building program is in full swing with the construction of two new boats and other projects. All of our boat builds are being done for educational purposes with the aim of utilizing boat building to teach creativity, critical thinking and problem solving. These are skills students can use in any endeavor throughout their lives. Everyone is welcome to stop in and join in the fun of creating something beautiful. The new builds are a perfect fit for public and private school students, our many friends throughout the three counties the Great Lakes region and of course the Sea Scouts. At the same time as all this is going on we are in process of modifying our shop space to make it more efficient teaching classroom and capable of a wider variety of tasks. This requires taking out a wall and some re-wiring. The new shop space will help not only our staff do a better job with students but will also help the Sea Scouts with a more productive shared space. Our new boat build is an 11’ 11” adaptive SCAMP. It is being constructed to become part of the SEAS fleet and a boat a solo sailor can set sail in with its innovative powered self-tacking chair. The self-tacking chair is a new concept and this component of the boat is under development and will be the first of its kind. Self-tacking means that as the boat tacks the sailor in the chair can also automatically tack the chair thus switching sides of the boat via electric power. The R&D for the chair is unique and a steep climb for our staff. We look for both engineering assistance and financial support so that we can fulfill the promise the adaptive SCAMP can offer sailors seeking autonomy. Let us know if you would like to participate in some manner. Plans are for the adaptive chair to be in the prototype stage this month and is being constructed in our facility. We are making good progress on the build of the sister ship to Robert Manry’s Atlantic crossing pocket yacht circa 1965. Manry was a Great Lakes sailor who in a most unassuming way rebuilt and modified an old 1930’s Old Town White Cap open dinghy for a secret song of his soul adventure. He towed his little 13’ 6” sloop to Falmouth, Massachusetts and 78 days later stepped ashore in Falmouth, England. We have the only other authentic Tinkerbelle (Manry donated his little sloop to the Crawford Museum in Cleveland in 1965) on the planet and are working to finish it this winter as a SEAS interpretative sailing version. This project will put a pin on the map for SEAS and our Tinkerbelle will serve as a roving ambassador at boat shows and events flying the SEAS flag. This is a fascinating research and development project of the highest order in that we have been granted first access to the actual Tinkerbelle and as a team we traveled to Cleveland and were able to board and fully measure the boat so that we can reproduce her accurately. Stop by our shop and take a look or lend a hand. Our student boat building initiative has taken off with the first group in for hands on building and did we have fun! Students and their teacher from Central High School came in for an orientation and the hanging of a plank on the adaptive SCAMP. Discussions are ongoing with the hope of setting up a formal Central High/SEAS boat building education program. Last month we conducted a first “Shop Tools 101” class and it was both well attended and lots of fun. Those who attended now have the ability to come into the SEAS shop with supervision and utilize our tools. Stay tuned for follow-up on classes centered on wood shop use, hand tool skills and boat building. We hosted a successful family Christmas ornament making party. Kids and their parents were able to cut our wood ornaments and decorate them for display in the home or on the Christmas tree. Our newest acquisition a beautiful Tartan 4000 is in the shop this winter for a bit of upgrading including some new varnish and self-tailing winches. SEAS is expanding its mission to include teaching maritime skills through wooden boat building. Organizations around the country have found that this traditional craft is an ideal way to teach practical, marketable skills, and that it can help develop ability in science, technology, engineering, and mathematics through hands-on learning experiences. The Sailing Education Association of Sheboygan (SEAS) invites you to an Open House to see our new facility and to find out more about what we do as an organization. Join us on Wednesday, August 8th from 5-8 pm, 1837 Superior Ave., Sheboygan, as we welcome our community and fellow boaters to experience what we have to offer. In addition, visit with Tamara Thomsen, Maritime Archaeologist from the Wisconsin Historical Society after her day of diving. Tamara will be here conducting an archaeological survey of the I.A. Johnson, a scow-schooner located a couple of years ago. Walk through displays of dive gear and survey items; historic photos and videos from the wreck site; and current survey plans. Steve Radovan, a local diver who discovered the schooner, will give a short presentation of his findings at 6:30 pm. The new SEAS facility houses the administrative offices, space for boat building and maintenance, a classroom space, and storage for our entire fleet in one location. After being spread across four locations, we are excited to call 1837 Superior Ave., Sheboygan our home along with our presence on the Lakefront. SEAS is a community boating facility with a vision of Boat for Everyone! We are dedicated to offer the experience of sailing to anyone with an interest whether it is one time or grows as a new hobby. Our staff encourages those with disabilities to come sail with us to feel the wind and have the freedom that sailing can offer. We offer a variety of sailing and powerboat classes, workshops, boat rentals and will be launching a boat building program in 2019. Please REGISTER for the event at https://seasopenhouse.eventbrite.com to let us know you are coming. Over the years, I’ve taken part in quite a few adventurous activities that I never imagined I’d be able to do. I went rock climbing in Utah, hot air ballooning over Israel, and even waterskiing in Tennessee. They all exceeded my expectations and after completing them I thought “If I can do this, I can do anything!” While these activities were made possible with a bit of creativity, one activity that I really never thought I’d be able to do was steer a sailboat. For one, the strength required to steer a sailboat is something I don’t possess and two, how would I even get into the boat? I’ve honestly never even entertained the thought of sailing because it truly seemed impossible (even more-so than waterskiing or rock climbing), but thanks to SEAS Sheboygan, I was once again reminded that absolutely nothing is impossible. SEAS Castaway Challenge gave spectators a great show on the 4th of July. There was a small resurgence of participation this year with eager participants to battle it out on the Sheboygan River. American Excelsior Foam Warriors take the lead from the Panda Express. The Open Division had six teams with one team as a great last minute entry. A gentleman came down with a cardboard canoe he built and raced in 1994 taking first place, to see if someone would like to use it, still being in perfect racing condition complete with a shark painted on it. As luck would have it, Cheyenne Stirdivant and McKayla Pirrung approached the registration table to buy a Drifter Kit to build on site just moments after the last kit was sold. These young ladies were asked if they would like to use the boat that was brought down and eagerly agreed as they wanted to participate. They raced the first heat of the day, naming the boat BFFs, and took first place just edging out their competition. Other teams racing this year were American Excelsior, Jessica Ambelang and Family, Burrows Aviation, and two teams from the Sea Scouts Ship 50. With teams using recycled materials to build their boats, they were creative with designs to fill this year’s them of Sail the 7 SEAS with decorating for your favorite vacation spot. Several boats were used in the past years with either new paint or a few modifications. Others were made with recycled cardboard or extruded foam. The competition was fierce but the Sea Scouts Ship 50 “Wilson” team of Hannah Post and Emily Fisher took the championship. This year the US Coast Guard came out with three teams to race kayaks against anyone that signed up. With the last second decision, the teams agreed to use the Sea Scouts’ cardboard canoes to keep in the spirit with the rest of the races. USCG teams of two raced against each other to determine who would challenge the young Sea Scout team. It was Jason Dwyer and Dashawn Johnson from the USCG against Patrick Fisher and Cenzo Ranieri from the Sea Scouts battling it out for the title. It was a close race with the Sea Scouts taking the win by blocking the USCG at the finish. The Drifters certainly did not disappoint this year. With 1.5 hours to build a boat from a kit including cardboard, swimming noodles, duct tape, small piece of foam, yard stick, utility knife, pencils and the bag it comes in, 14 teams were ready to race. As we’ve seen each year, design is crucial to ensure your boat will float as several teams sank at the start line. Others took on water but still made it to the finish. With boats still sea worthy, the championship included the winners of each of the previous five heats. Whatever Floats Your Boat, Andrew Suscha and Katie Reinemann, took the Drifter Division. Teams still able to race rounded out the day with a consolation race. 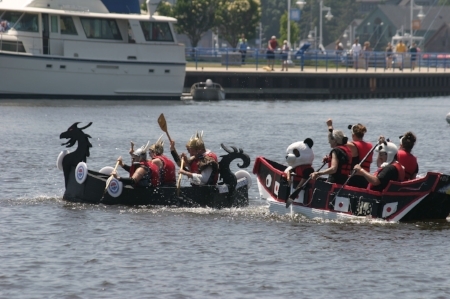 · Most creatively recycled went to Jessica Ambelang’s Panda Expressed for modifying a boat from previous year. · Team Spirit went to American Excelsior’s Foam Warriors for their costumes and enthusiasm. · Best sinking in the Drifter Division went to Anchor, Matt and John Begotka for their animated rollover sinking. Thank you to our sponsors that helped make this event possible: Allstate Insurance-Jerry Bodart, Sly’s Midtown Saloon & Grill, Zufelt Law Offices, LLC and Bethany Reformed Church for having the brat fry on the hill. A special Thank You to the North High Drumline for entertaining us between races. These students have a ton of energy and are so much fun to watch. SEAS is proud to announce we will be hosting the 2018 SCAMP Camp group boat build June 11-22 at our new facility. We are very pleased to partner up with sailor, boat builder and educator Howard Rice who will lead the build at our new SEAS facility. This is an exciting development for SEAS as it directly fits into our public outreach and education mission. Our facility is for everyone and we invite our members, friends and the public to stop in to visit during the build. Visitors will be able to experience a fascinating wood boat build in process first hand. The build is open to the public between June 9th and June 22nd. Young sailors and students in particular are welcome to stop in. Set up for the build will begin the weekend of June 9th with the construction and truing of the build strong backs. The public is welcome for the set-up process as it is an integral and educational part of any boat build. The actual build begins Monday morning June 11th at 8am and runs Monday through Friday for ten working days. Howard and his voyaging SCAMP Southern Cross were with us in April for presentations about his recent voyage down the Strait of Magellan and the Beagle Channel in one of these capable pocket sized yachts that he built specifically for the trip. Howard will be back in Sheboygan for the build with Southern Cross, which will be on the water and sailing as a demonstration of how capable this type of micro or pocket yacht can be. Hundreds of sailors world wide have figured out there is something special about this little pocket yacht named SCAMP, and with Howard SEAS offers this exclusive opportunity to partially build one with instruction and fellow builders with willing hands. There are few better ways to learn boat building skills than through actually building a boat with a knowledgeable boat builder/instructor at your side. There are sign up options to either build your own SCAMP during the Camp or simply join in the build a to learn boat building skills so you can build your own or another small boat in the future. If you dream of sailing over the horizon in a tiny boat, would like to engage in fun racing, or if a lazy sail up a calm river suits your tastes, then SCAMP may be an ideal small boat for you. We had the opportunity to spend time around Howard’s SCAMP Southern Cross in April and were very impressed. SCAMP’s are fun to build, an act of creative expression, easy to handle by one person, can carry an amazing load, are nimble, fun to sail and about as unique as can be in a world of cookie cutter boats. The real fun in the concept is that SCAMP was designed as sleep aboard coastal camping and beach cruiser or as some refer to the type, a pocket yacht. SCAMP is also a US Sailing registered one design class. This 11th SCAMP Camp is a group boat build that is both highly instructive, very productive and just as important is a huge amount of fun. At the end of Camp participants will have a highly accurate hull ready to finish and fit out. Two new builds have been confirmed and booked for this session. Other SCAMP’s under construction will also be at the build making for an interesting and educational opportunity. Each day Howard will facilitate and instruct the build and will offer a small craft specific chalk talk covering any small boat use topic the class wishes to discuss ranging from living aboard to sail trim. We are are pleased to announce that Howard has offered a full tuition scholarship to one lucky student to be selected by SEAS. This scholarship will be made available to one lucky Sheboygan student who will then be able to take part in the build as a full participant. What an opportunity! Scholarship rules and deadlines will be made available shortly! For further information on SCAMP Camp and small boat adventuring please visit http://www.thepocketyacht.com/scamp-camp/ or contact SEAS at info@seasheboygan.org. orld Sailing, the world governing body of the sport, has chosen the Royal Northern & Clyde Yacht Club to host the Blind Match Racing World Championship from 1 – 7 September 2018. It is expected that the world’s top visually-impaired sailors will travel to the Helensburgh-based sailing club to compete. 018 will mark the first time the Blind Match Racing World Championship has been held in Great Britain. “We are delighted to have been selected by World Sailing to host the Blind Match Racing World Championship. As a club we regularly compete in, and host, international regattas but this will be the highest level of competition the club has hosted in recent times. “Previous blind sailing worlds have attracted the very best sailors and we are really looking forward to welcoming teams from around the world to our club. Arrangements are already moving into place and our members are working hard to make it the best Blind Worlds ever. “World Sailing is thrilled that the Royal Northern & Clyde Yacht Club will be hosting the 2018 edition of the Blind Match Racing World Championship and welcoming world class sailors to compete on their waters. “The club have made a wonderful commitment to grow blind sailing and inspire new sailors to take up the sport. This, coupled with world class facilities, makes them a perfect fit as hosts of this major event. Continuing the safety discussions from last month, this article will feature topics related specifically to cold water safety and survival. Here on Lake Michigan the cold water can be very dangerous well into June and beyond. Many of us have experienced a strong west wind in mid-summer where the air temperature is gorgeous and the water temperature is cold, proof that even at the peak of summer cold water can be a danger. Being prepared with appropriate clothing and wearing your lifejacket can be an issue of life or death, particularly in the early season. It’s a great idea to wear your lifejacket at all times when on the water. Last month’s article discusses this topic in more detail, but the fundamental truth is wearing a lifejacket will greatly increase your chance of survival in all man overboard situations. Taking the time to find a comfortable lifejacket suited to your activity is important and eventually wearing your lifejacket on the water will become as second nature as putting on a seatbelt in the car. Survival time in cold water is often longer than people think particularly if you’re wearing a lifejacket. Without your lifejacket you are at greater risk and we’ll talk about those risks later. The greatest risk, beyond drowning of course, is hypothermia. Wearing a life jacket allows you to use survival positions that minimize heat loss. Swimming and treading water actually speed up heat loss as the cold water constantly flows over exposed areas of the body. The H.E.L.P. Position (Heat, Escape, Lessoning, Position) helps keep your body heat in and essentially involves condensing into a small area to help trap in your body heat. The Gasp Reflex or Inhalation Response is another important reason to wear your lifejacket while on cold water. The Gasp Reflex is an involuntary reaction to your body entering cold water. The Gasp Reflex has led to fatalities due to victims inhaling water and very quickly drowning. Lifejackets provide some level of protection as they keep your head near the surface even when jumping or falling into the water. The floatation of the lifejacket will also bring you back to the surface even if you are unable to yourself. Beyond your lifejacket it is important to consider what gear to wear on the water. It is easier to dress for cold water when the air temperature is also cold, but when the air temperature is warm and the water still cold it can be more of a challenge. While there are no perfect answers, here are some general rules to follow. - Layers! Just like your mother taught you, when it’s cold wear layers that you can easily add or remove for comfort. o Modern Base Layers like Under Armour or other thermal wicking materials are great. Gill has a great base layer set that I love wearing! I wear them undershorts well into the summer when the water is cold, they provide some protection from the cold and added benefit of blocking the sun’s UV rays. o Middle Layers vary considerably, typically a fleece or softshell work great, wool is also a traditional choice as it will keep you warm when wet (but it’s heavy when wet!). Avoid cotton, denim, and other non-wicking fabrics as they will actually promote heat loss when out of the water. o Outer Layers are traditionally foul weather gear while sailing or fishing. These can be relatively light weight and designed for water repellant or larger heavier gear that helps provide warmth. It is important that this gear helps block the wind and keep the wearer dry. Hard shell winter jackets will serve this purpose well if you don’t want to invest in expensive foul weather gear! o Drysuits function by keeping you encapsulated in a waterproof suit. They have no thermal properties of their own so base and middle layers are important. Note: You will sweat in one of these and that water is trapped inside with you, it is essential that you wear proper base layers to help address this! o Wetsuits work well for small boat sailors, surfers, and others who know they are going to get wet. They come in a variety of thickness for various conditions. Surfers here on Lake Michigan are famous for their deep winter surfing and a high quality winter wetsuit can keep you warm in extreme conditions. Wetsuits are worn on their own with at most a rash guard underneath to prevent chafing. Other safety equipment such as survival suits are out there but less likely to be utilized in all but a few activities here on Lake Michigan. Now is also an appropriate time to recommend doing man overboard drills each season with your crew regardless of how long you have been sailing together. A few years ago during a late May regatta the lifeline on a nearby boat broke and sent one of the crew into the cold water without a lifejacket, a quick and proper man overboard recovery got him out of the water in a matter of minutes. Practicing this is important and, yes, you can do a man overboard recovery with the spinnaker up but that is another topic. Practice this often and your crew will be all the safer! A great video showing the effects of cold water immersion called Cold Water Boot Camp was put together about 10 years ago and is a great resource for understanding the effects on individuals: https://youtu.be/J1xohI3B4Uc. As simply as it gets, when the water is cold: Dress appropriately and wear your lifejacket! The Sailing Education Association of Sheboygan (SEAS) recently announced the promotion of Geoff Rudolph to executive director. Since SEAS began in 2012 Leslie Kohler has lead the organization’s development as chairman of the board with a vision of making boating accessible for everyone. This is a vision that both she and her late father, Terry J. Kohler, shared. Their passion for sailing and the educational and recreational opportunities it provides lead them to form SEAS and bring the experience to all of Sheboygan County. “In the past few years, SEAS has grown dramatically in the numbers we serve. We added more staff to serve the community and it became time to name an executive director” according to Leslie Kohler. Rudolph joined SEAS in May 2016 as the fleet director, responsible for making sure all of the boats remain in pristine condition. As the discussion of building a new facility continued, worked with the architect to incorporate all the needs of the organization under one roof while expanding the capacity for the future growth & functions of SEAS. “As SEAS looks to the future and the role it will play in STEM education and boating instruction and building in the community, Rudolph’s experience gives him the tools needed to lead this organization”, said Leslie Kohler. Prior to SEAS he was contracted by Maritime Heritage Alliance in Traverse City for two winter restorations on the gaff rigged cutter Champion and Captained their Sail Champion Program for at risk youth. Rudolph co-founded the Red8 Boat Works while in Traverse City, which works with High School aged students teaching skills needed to build boats and character. He was introduced to Sheboygan and SEAS when his first mate on the Champion asked him to be the coach for the US Blind Sailing Team for the 2014 Blind World Championship in Sheboygan. “I look forward to helping SEAS grow and the challenges of building new programs in the Sheboygan area. It is a rewarding experience watching young people develop new skills and achieving a greater sense of self.” Rudolph said. Spring is a great time to think about your safety while boating. SEAS recently wrapped up a two day US Sailing Safety at Sea course. The two-day version meets World Sailing’s offshore requirements, but more directly important to us sailors, it had a hands-on component. Day one consisted of traditional conference style presentations on important topics related to offshore safety and survival, and on Sunday in the Sheboygan North High School pool, wearing full foul weather gear and inflatable life jackets, learning survival and rescue skills. Yes, it was fun, and a valuable learning experience. I encourage this course to anyone and everyone. With safety on the mind, I am going to run a short series for the next three months in this column focused on a safety topic. Much of the information can be found in greater detail in US Sailing’s Safety at Sea book and through their website http://www.ussailing.org/safety/. Other great resources include Chapman’s Piloting and Seamanship and The Annapolis Book of Seamanship. This month will be on personal flotation devices (PFDs), April will cover cold water topics, and May will follow up with some essential safety gear and tricks to training your crew. While Safety at Sea is focused on offshore I will try and address topics for our nearshore audience as well. The fundamental truth reinforced by statistics is we should be wearing our lifejackets at all times. In 2016 the US Coast Guard counted 4,463 accidents and 701 deaths. For events in which the cause of death was known, 80% (509) were from drowning and 83% of those who drown were not wearing a life jacket. The USCG requires all boaters to have a lifejacket easy to access and able to be put on quickly in the case of an emergency and Federal law requires children under the age of 13 to wear an approved PFD while on federally controlled waters. Everyone on board a personal watercraft (think Jet Ski) must be wearing their PFD. If you plan to spend time on the water it’s worth the investment in a lifejacket that is comfortable and fits your needs. There are a lot of different Type III life jackets on the market to fit different sport, mobility, and comfort characteristics. A comfortable life jacket that is fitted to your preference can be easy to forget you are wearing! If you choose not to wear your life jacket make sure you properly fit one prior to getting underway and store it in an easy to grab place. For day sailing, or most nearshore daylight activities a Type III will be a solid choice. Add a quality whistle and you should be suited to most situations that may arise. 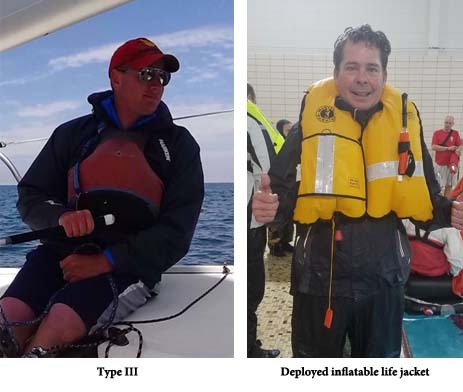 For distance and night sailors, it is worth the research and investment in the technology of inflatable life jackets/harness combinations offered on the market today. Anyone venturing offshore should invest in their own PFD. Offshore means it could take dramatically longer for help to arrive and if sailing at night you need to consider visibility a critical factor. Inflatable life jackets with harness attachments are designed to be worn around the rib cage to avoid injury from a sudden stop at the harness point. They should be snug but not tight and leg straps can be left slightly loose as most models are easy to adjust in the water. It is important to familiarize yourself with your inflatable life jacket as they are not as intuitive as the foam version. Some inflatables deploy automatically when in the water while others require the manual pull of a lanyard to deploy. If there is a failure with the CO2 deployment you need to know where the manual inflate tube is to blow into. To familiarize yourself with your inflatable life jacket it makes sense to inflate annually with lung power (deploying the CO2 cartage puts more pressure on the seams and while it is good to do a few times for familiarization it is better not to annually). This will allow you to know what gear you have, where it is, and how the lifejacket fits. Make sure to leave it inflated for a bit to ensure there are no leaks. Check that your inflation system is still in working order and replace if necessary. Most manufacturers have created easy to follow repacking instructions for their lifejackets so don’t let that scare you away! The topic of lifejackets and personal floatation devices can be extensive and this is only a small bite of all the information and considerations to make. What is important to keep in mind is the value of wearing one and at the very least have a safe, ready-to-go vest or inflatable with you at all times! Residents, educators, business leaders, tourism executives, environmental groups, and elected officials from the Cities of Port Washington, Sheboygan, Manitowoc, and Two Rivers have reacted with disbelief and disappointment to Governor Walker’s action rescinding his 2014 nomination of the area of Lake Michigan off their communities to be American’s newest National Marine Sanctuary. The entire sanctuary designation process began with that nomination, which the Governor himself had submitted in November 2014 on behalf of the citizens of the State of Wisconsin. The nomination was officially selected by NOAA (National Oceanic and Atmospheric Administration) to begin the Sanctuary Designation process and was perceived to be well on its way to Final Designation in late 2018 or early 2019. Once designated, the Wisconsin-Lake Michigan National Marine Sanctuary would become only the second Sanctuary in the Great Lakes and the 15th Sanctuary nationwide. The regional nomination as submitted to NOAA detailed a proposed 875-square mile area National Marine Sanctuary, stretching from Port Washington to Two Rivers. It would contain 39 known shipwrecks, including the two oldest shipwrecks in Wisconsin and 15 intact shipwrecks (three with standing masts). Fifteen of the 39 shipwrecks are on the National Register of Historic Places. NOAA would assist with location, identification, and preservation of another 80 or so expected shipwrecks. “A National Marine Sanctuary in our Mid-Lake Region will be a economic bonus for our four communities and the region and will serve as a tremendous source of pride and celebration for our entire State of Wisconsin,” said Chad Pelishek, City of Sheboygan Director of Planning & Development. Sheboygan, Wisconsin, has been chosen to host the 2018 Para World Sailing Championships. The event, which will be held Sept. 16-22, 2018, is being hosted jointly by World Sailing, Sail Sheboygan and the Sailing Education Association of Sheboygan (SEAS). The event continues the efforts of SEAS to become a hub for adaptive sailing for children and adults with cognitive or physical disabilities. In addition, the Para Worlds Sailing Championship is the definitive guide to the best-of-the-best in Para Sailing with clear objectives to showcase and develop paralympic sailing, create sporting heroes and engage sports fans, and excite sponsors and broadcasters. Tom Atkins of Sail Sheboygan said hosting the 2018 Para Worlds helps fulfill Sail Sheboygan’s mission of bringing national and international competition to Sheboygan. In addition, it contributes to a commitment to facilitate adaptive sailing at all levels, from beginner sailors to competitors. At World Sailing’s upcoming Annual Conference in Mexico, the future of the Para World Sailing will be discussed and debated as the sport aims for reinstatement into the Paralympic Games Sports Program. Sheboygan, which has become known for hosting such events as the PGA Championships and is line to host the 2020 Ryder Cup, is excited to bring elite athletes to the community for the Para Worlds, Atkins said. Sheboygan was the host of the 2016 Women’s Match Racing World Championship and Blind Match Racing World Championship and the 2017 Blind Fleet Racing World Championship. In addition to the announcement on the 2018 Worlds, World Sailing is also inviting member National Authorities and Host Cities to bid for the 2019 Para World Sailing Championships. The Sailing Education Association of Sheboygan (SEAS) broke ground Monday on a new boat storage and maintenance facility that will also house their headquarters, education rooms, and provide a controlled environment for volunteers and staff to maintain its fleet of power and sailing boats. SEAS chairman, Leslie Kohler, staff, board members, The Vollrath Co., LLC representative, Jos. Schmitt Construction and LJM Architects break ground on 6/27/17. Through a donation from The Vollrath Co., LLC, SEAS was able to obtain a 1.75 acre parcel near the corner of Superior Avenue and 18th Street. With donations from other area supporters SEAS has been able to jump-start this project. “We are excited to be able to finally reach the point in our organization’s development where we will not just maintain our fleet in our own facility but have designated space for education and to house our staff,” according to Leslie Kohler, Chairman of the Board of SEAS. “In the past, SEAS has had to contend with offices and equipment spread out across the city and county in rented or borrowed space not suitable for many repair and maintenance projects, certainly no room for public education,” she added. “Putting this under one roof will add efficiency to the operation, foster public access to boating and promote camaraderie among our staff, volunteers, students and the public,” Geoff Rudolph SEAS Operations Manager said. The building was designed by Erik Jensen and LJM Architects. “It will be a 26,250 sq. ft. single story structure with a mezzanine, and large enough to store the entire fleet with room for growth,” according to Jensen. “Design features include a band of translucent glazing at the second-story height to allow for generous day-lighting of the entire interior, large outrigger supported overhangs and an aesthetic blend of strong horizontal and vertical lines. The building will be finished in “gallery blue” siding to blend in with the buildings in the area. The new building will house the administrative offices, a shop and space for boat building and maintenance, a classroom space, a separate room for Sheboygan Sea Scouts Ship No. 50, and storage for SEAS entire fleet in one location,” Jensen said. “As a lifelong sailor, Air Force jet pilot, MIT graduate, and successful businessman, the late Terry J. Kohler understood the multiple disciplines of sailing and boating in general. He understood how learning those disciplines through sailing you can become better at decision making and problem solving, helping you to be more successful throughout your life. Terry’s vision was to provide access to learning boating skills to as many people and future generations as he could through the formation of SEAS,” explained Jerry Baumann, Vice President of Operations for Windway Capital, Corp.
“This location and design was developed out of years of searching and planning. Balancing the needs of the organization, the budget, and the community led us to where we are today. This will be a major step forward in providing quality boating programming to the community,” said Matt Wierzbach, Program Director for SEAS. Jos. Schmitt Construction Co., Inc. is providing general contracting services and expects construction of the new headquarters to be completed in the fall of 2017. “We believe that water related activities are fun, build character, develop mental and physical acuity and should be enjoyed by everyone,” says Leslie Kohler. Last fall, SEAS began designing strategic focus areas to grow our programs for the future. The four areas of focus bring our mission of Boating for Everyone to the forefront of everything we do. Within these areas, we look to develop and expand our presence in Sheboygan County, our surrounding counties and throughout the Midwest. We are excited to share this with you and hope you join in our excitement. SEAS has become a leader in blind and visually impaired sailing community by hosting clinics across the country and hosting two major blind regattas in the past several years, including the 2016 World Sailing Blind Match Racing Championship. We are committed to our efforts in blind and visually impaired sailing with the intent of hosting a regatta each year and continue fostering growth through outreach and clinics. Our sound buoys have been improved and were featured at the 2017 US Sailing National Sailing Program Symposium in Austin, Texas. Adaptive Sailing programs at SEAS reach beyond the visually impaired community. We have done extensive work with Harken to create a system for individuals with life changing conditions such as ALS to enjoy sailing with the help of customized equipment. This has allowed to partner with the Wisconsin ALS Chapter, but we are not stopping there. Thanks to a generous donation last year, we were able to add another Sonar to our fleet. The "Katie" will be dedicated to advancing adaptive sailing in Sheboygan. SEAS is now a US Sailing Accredited Adaptive Sailing Program. We are looking to expand our reach throughout the community, state and the Midwest to give individuals the opportunity to have the freedom sailing offers. We are committed to seeing more individuals out in the future and work with individuals or groups to provide sailing education experiences for a wide range of abilities. While Community Boating has always been a part of our programming and vision it has been a challenge to implement effectively. Realizing this has been our weakest program we have set about a plan to significantly overall the program in an effort to provide a better service to the community. Working closely with the Sheboygan Youth Sailing Center (SYSC), there will be more opportunities to rent a Sonar from SEAS or a J24 from SYSC. Rentals will begin June 1st with limited blackout dates and dedicated staff on the grounds during scheduled hours. Rentals from SEAS will require a membership, which includes a 2-hour rental. Reserve your rental time by emailing rentals@seasheboygan.org or calling 920-395-5253 (seasonal number). Let us help you sail this summer. SEAS is the only US Powerboating Certified Training Center in Wisconsin. Our staff is proud to offer exceptional training both in the classroom and on-the-water. Our training courses will provide you and your family the highest level of boating education with a variety of classes offered: Safe Powerboat Handling (SPH) and Accelerated SPH, Safety and Rescue Boat Handling and new this year Mark-set Boat training. Our application for US Sailing Keelboat Accreditation is in process. This certification will allow us certify students for Basic Keelboat which is the first step in the US Sailing Certification series recognized nationally. As participation increases we will begin expanding into cruising and other advanced keelboat training opportunities. Training goes beyond our sailing season though. We will continue to offer a variety of boat maintenance workshops, maritime history lectures and other programming to bring year-round activity. The future looks bright for training with area high schools. SEAS is building a relationship with South High School to develop a curriculum in sailing instruction with their initiatives in STEM education. We are looking forward to a rewarding partnership and expanding to other high schools in the county. As you can see, we are expanding in many directions. The only way to make this all possible it to reach a broader audience in these areas to bring more people to the Sheboygan Lakefront. We will continue to increase our presence on social media through Facebook, Twitter and Instagram and reaching out to organizations to partner and grow with. This will be the second year SEAS hosts the 4th of July Boat Regatta on the river. We would like to encourage you to consider making a boat this year and help us grow this fun event. To bring more awareness to our Adaptive Sailing program, we will be attending Rehabilitation & Transition Conferences in Wisconsin and seeking speaking opportunities to promote our programs. We are creating informational pieces to showcase how SEAS is helping to build a larger boating community in Sheboygan County. Each of the above areas has a target area of focus which will bring a comprehensive outlook to SEAS. Watch for more updates on classes, opportunities and events as we get closer to the sailing season. You will be seeing a lot more from us.